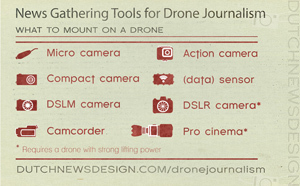 If toy shops sell drones to kids, it can’t be that hard to become a drone journalist, right? In 7 days Your Flying Reporter became a competent yet uncertified drone pilot. 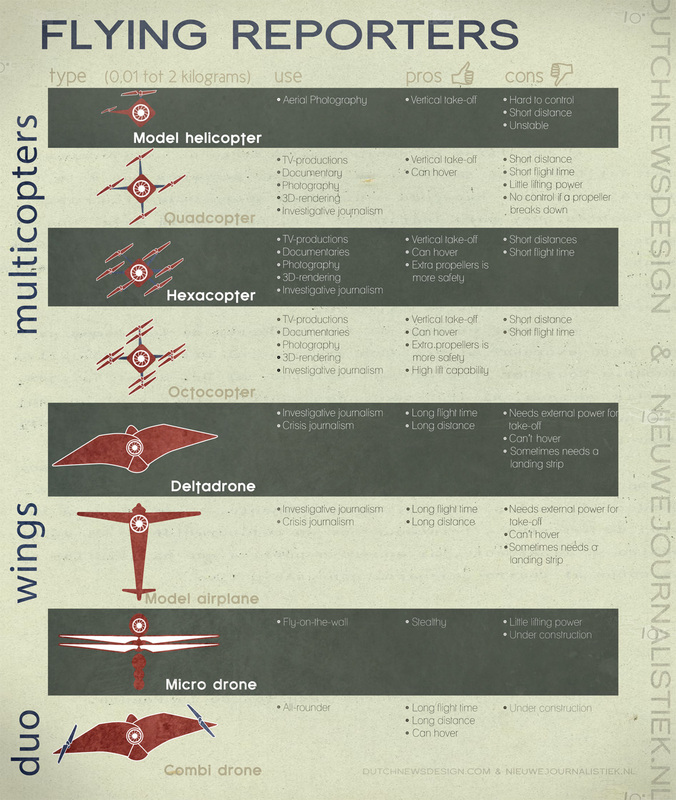 Yes, flying a drone is easy. Cinematographic flying is the real challenge. ‘Practise, practise, practise,’ Jan van Uffelen proclaims as we walk the mucky acre, placing our mud-caked boots between the rows of chopped maize, at nine-thirty in the morning. Van Uffelen is an experienced drone pilot from the Netherlands. In his hand, he casually holds the drone. It’s a prefab quadcopter – four propellers – equipped with an action camera perfect for straightforward reporting. Earlier this morning Van Uffelen got everything set up: A tripod with a take-off platform. A secondary camera on a lengthy pole, to record our doings. He plants the drone upon the platform and switches on the device by linking up the battery. A plastic disc protrudes from the side, loose wires, Velcro, tape – the commercially manufactured drone bears significant traces of its very recent genesis in the multitudinous DIY-community. Noisy humming, and then the machine takes off, circles above us, hovers perfectly still for a split second to take our picture. Then it flies off to make a tight drive along a line of willow trees – typical for the Dutch countryside. When the drone returns in a fluent movement to where we stand, Van Uffelen keeps it hovering at eye level. He steps forward, reaches out, and here you find me catching my breath, he reaches out and grabs the device out of the air. The furious buzzing of a huge wasp caught in a jar reverberates from where he stands, and after a long moment dies away. He walks towards me. Holds out the device. There. He made it look easy. Now it’s my turn. The machine circles above us, hovers perfectly still for a moment to take our picture, and flies off (left, Van Uffelen; right, me). Almost. There is a small drawback. Van Uffelen allows no flying before going through a strict procedure. 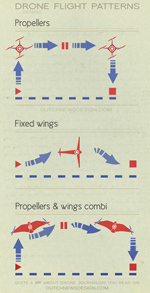 If followed in the wrong order terrible things will happen: propellers suddenly starting to rotate, sensitive parts breaking down. We repeat the procedure several times. I’m glad to do so. Not only because of the expensive equipment (this is just a basic thousand euros model, Imagine crashing a ten thousand euros multicopter). It is also for safety reasons. Finally, my coach thinks I am ready. In my hands I hold the radio remote controller. In front of me is the drone. According to the Dutch Regulations for Model Airplanes, I am now officially the Captain. Aye-aye sir, boys with toys. And here the boy’s mouth forms a wide grin. I pull the two joysticks backward and promptly the device starts buzzing. Van Uffelen reaches out and, grabs the device out of the air. Most pilots advice to ‘land’ a drone like that. ‘Take a few steps backward,’ Van Uffelen hollers. Recalling visuals of teared body parts caused by rotating propellers on the internet, I willfully obey. It is now a matter of ascending vertically. ‘not too slow, otherwise the drone will tumble forward,’ I hear him say. Suddenly I realise the drone is airborne. First I am told to hover for a while as the GPS needs to establish a connection with the satellite based on our location. If we happen to lose the WiFi-connection, the drone now will return to us on auto-pilot. Then the actual flying begins. On his instructions, I push the joystick a bit to the side. Immediately the drone makes a nervous movement to the right. A more subtle pull to the left results in a calmer movement. Pulling the second joystick makes the drone spin on its axis. It all works amazingly. This is it. This is how it’s done. This is how easy flying a drone is. Yet I do feel that this isn’t a children’s toy. My hand movements all have to be so calm and quiet. Until now I haven’t looked away from the quadcopter for a single moment, but now I cautiously lower my eyes to the video screen attached to the controller. Some drone pilot use eyewear, so the screen is all they see, like in a computer game. But for now I’m glad I can see the actual device too. Carefully I try a rider – which is movie jargon for a fluent motion to the side, while the camera faces forward – surely it will be known as a glider soon, in dronese. The movement seems to work. Panning the camera while the drone is hovering proves harder to master. The drone has to hover for a while before a camera pan can be set into motion. Definitely this technique requires practise, practise, practise. I am now even more impressed by the viral video of the Utrecht’s Dom tower by fog in 2014. True craftsmanship, I realise. A red light blinks on the drone. I give Van Uffelen a startled look, but he negligently raises his eyebrows. Just a low battery, I should fly a closer to the ground now. If the battery breaks down, the drone will drop less hard. I slowly fly back to our position. ‘Leave it hovering like that,’ Van Uffelen says. ‘Now grab it’. Eek. I pull my head in, sneak with a stretched out arm up to the drone and quickly grab one of its legs (not the one with the compass wire, I remembered that just in time). Again the angry wasp, until I pull the joysticks backwards. The buzz fades. High above the land I’m flying towards a huge oak with a broad stag-headed crown, some 300 metres away. Closer and closer. From where I stand I actually cannot see how far it is, how close I am. The video screen doesn’t give me enough information either. According to Van Uffelen it is best to move in a vertical direction upwards when I get near the oak, in order to fly over. ‘But now you should return, I think you are already too close for that.’ The red light blinks also. A flight back, buzzing the muddy land. The sensation of freedom I secretly hoped for is missing – that is an experience for later, when I watch the visuals from behind my computer. The drone is nearby now. Most drone pilots at online forums advise grabbing the drone from air, but to me a landing in the soft grass seems increasingly appealing. Under my video-game trained hands the device slowly descends. Up an inch, and down again. Tall grass is blown away by the rotor. Just a little further, and then the drone has landed. Perfect. ‘Fine job. Most of the time he’ll tip over,’ Van Uffelen remarks matter-of-factly. No more tutoring. Just me and the drone. If I would have been a professional drone pilot, this one flight would have required an extensive amount of bureaucratic proceedings, including written permission from over five different governmental organisations – the applications would have to start weeks before the actual flight. I don’t apply for anything. I am a journalist and this is my undercover operation. A wobbly legal construction indeed. But new legislation is on its way, assured Dutch State Secretary for Infrastructure and Environment Wilma Mansveld me recently by e-mail. So before long, this dark and dreadful secrecy is no longer required. For now, I cheerfully decide to keep to the rules of the Regulations for Model Airplanes – designed especially for unmanned radio controlled model airplanes. Most important rule: don’t endanger persons or goods. I suppress the reporters urge to find a place with lots of activity going on. Basic techniques have my priority: Flying and cinematographic camera motion. A befriended farmer has a piece of land, and I ask his permission to fly there. It is an acre similar to my training ground – maize and potatoes have been harvested mere days ago. ‘Why not,’ he says. And through the barn? The chicken barn doesn’t strike him as a smart plan, but the long cow barn might be possible. As long as the animals don’t get restless. It sound like the perfect challenge for later. First I find my lonesome acre. The drone is still in the trunk and I’m unpacking when a fifteen year old boy tears by on a mini-moped. First he sits himself on a bench some hundred metres along. Then he drives back. ‘Whats your doing?’ he asks. I’m flying a drone. ‘Oh’. He heard about those. ‘Does it fly far?’ A few hundred metres, I answer. 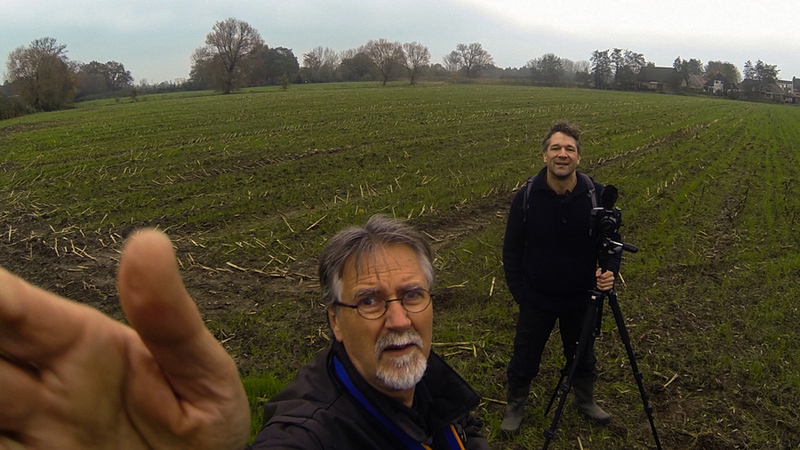 While switching on the gimbal – the stabilisation system for the camera – he keeps firing away inquisitively. How expensive. How high, How fast. That particularly. I circle a few rounds, land, take-off, buzz the fields. The batteries have a short life. 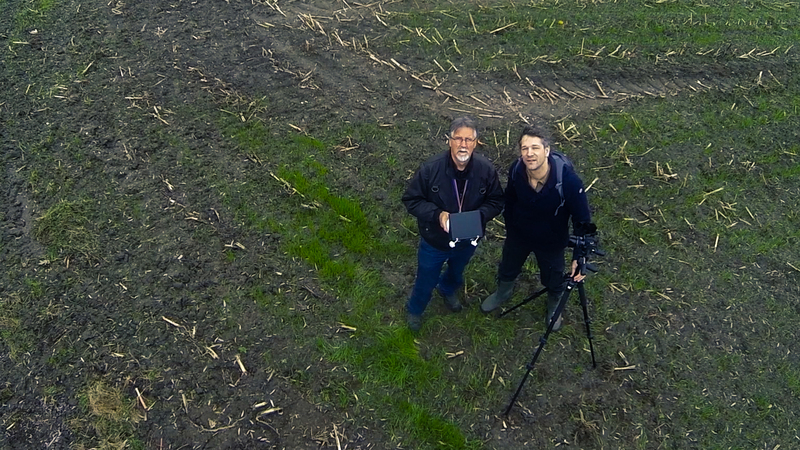 Everything on the drone breaths beta-version technology, there is so much to gain. Mid air hovering is still a challenge, but I checked my footage yesterday, and slow-moving navigation results in beautiful images. And that I can do on the third day of training. After an hour or so all batteries are dead. Time to pack up. I’ve been in the air for maybe twenty minutes. The rest has been spent on unloading, unpacking and changing batteries. It is windy and rainy. No droning weather. Note to industry: your drones are useless during wind, storm and rain. Farmer Ab pulls up besides me in his green old jeep. Am I keeping an eye on the farmers, he smilingly asks. I know what he means. Civil servants monitor this area by helicopter, checking for illegal building activities. I explain about my research project. Tell him some agriculturalists use drones. 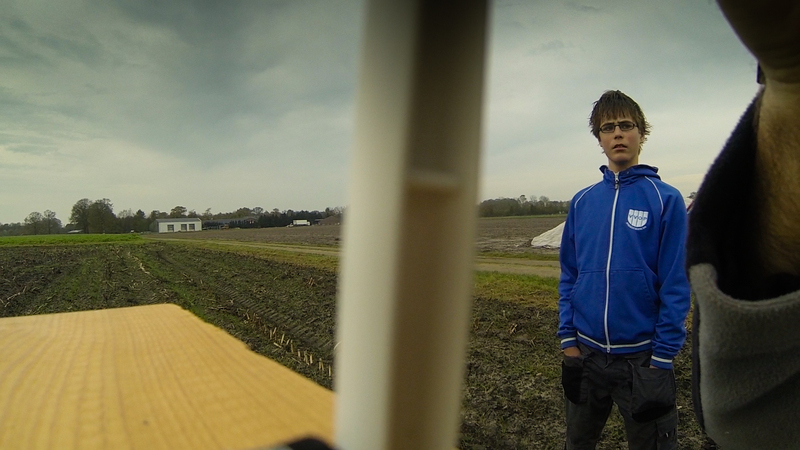 There’s one in Noord-Brabant who’s monitoring his potatoes from air. Yes, Ab heard about him. Liked it even, because when he was up in his tractor he had a much better view of bad spots in the field. A long silence falls. Silences are still allowed out here. Then Ab asks if I would be able to spot hare lairs. We’re on his shooting ground. I have no idea, and agree to give it a shot. Great. In Africa drones are used to hunt down poachers, and here the hunter wants to deploy it at first encounter to monitor the game population. With Ab watching I skillfully fly the drone under an arch formed by the intertwined crowns of two trees. The propellers chop off the heads of tall dry and dead weeds. After three minutes the battery is dead. My last one. No more chasing hares from their lairs today. For an absolute vivisection free drone report, I decide to practise once more. This time around some cows in the field. The weather is perfect, the action camera mounted on my drone is designed for this. Blue skies, high clouds. 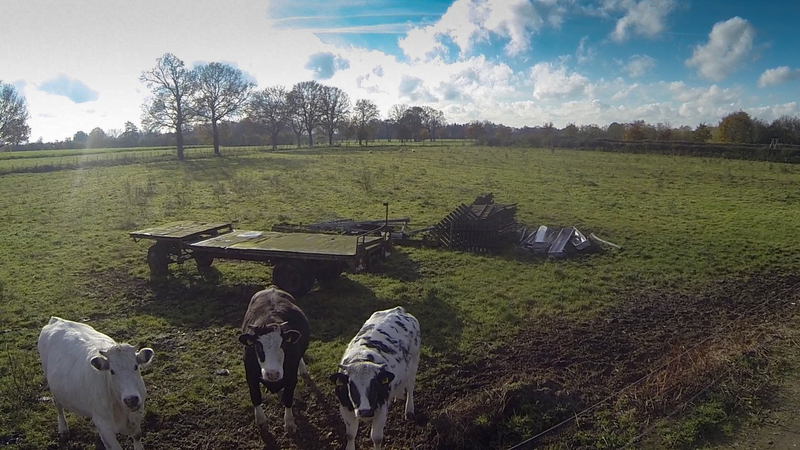 Three ruminating animals and a quadcopter. At taking off they leisurely tilt up their heads to the furious wasp. When the device hovers slightly too long to their liking, the cows grow a bit restless. Seconds later they dash off. And they remain slightly nervous, to my dismay. I feel absolutely ready to fly the long barn from the one entrance to the other. Not a single doubt. But now those silly moos queer my pitch. Had there been human beings standing in that barn, I’m convinced no questions would have been asked, as flying inside a building is permitted. But animals today are sacred in the Netherlands. Of course I would fly in and out of the building, and that would be considered ‘too close to continuous building’, according to the Regulations for Model Airplanes I intended to keep to. Hmpf. Do it anyway? Despite State Secretary Mansveld’s explicit warning? She wrote me to expect that journalists are the first to be ‘pointedly confronted with the regulatory boundaries’. The animals leisurely tilt up their heads to my angry wasp. Maybe I did try it. Maybe I did fly through the barn. Maybe the cows remained quiet, because they just had been fed. If, and only if I tried, it was without the action camera mounted. I can’t quite remember. 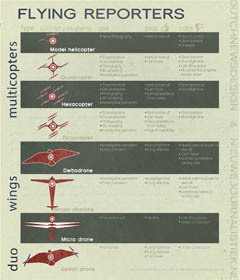 So, to wrap it up: Flying is easy, cinematographic control is the hard part. To master that, you need to practise a lot. 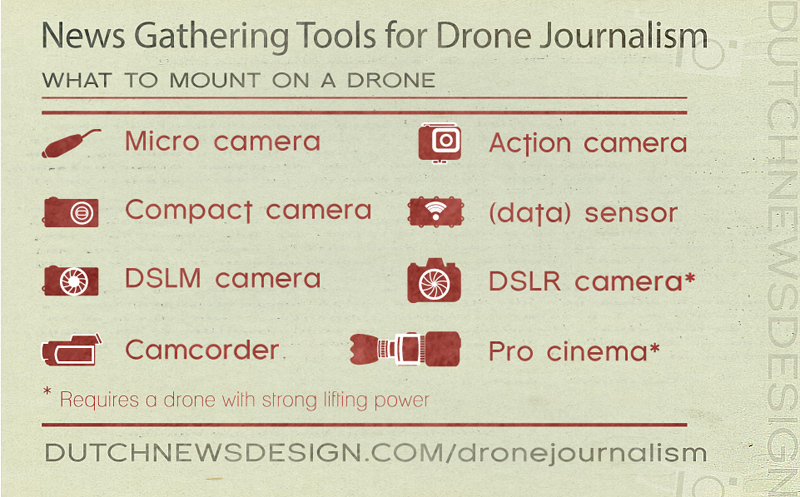 But if you do the drone provides a fantastic supplemental tool for journalism. It enhances breaking news reporting, enhances photography, TV reporting, and documentary making. As long as the weather is nice.